Performance has never been easier. Edge Products is pleased to offer you two standout products in one kit to optimize your diesel truck’s power, fuel efficiency, and overall driving experience. 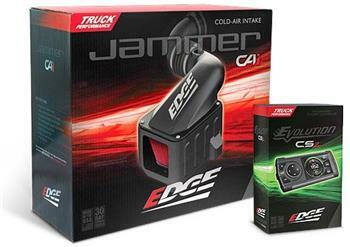 The new Stage 1 kits from Edge include a best-in-class Evolution programmer and Jammer cold air intake. We’ve bundled superior performance with tremendous value and savings. Review the product details and coverage below. Be sure to see just how much money you can save by purchasing a Stage 1 kit as opposed to buying these products individually. Power, savings, and reliability are available now for your driving pleasure. The Evolution reprograms your vehicle’s stock computer. It resides in the cab with one simple cable connection to the OBDII (diagnostic) port. The Evolution is used to save the stock files from the vehicle’s computer and then upload the Edge calibrations into the vehicle’s computer. This amazing product is available for both gas and diesel pickups and SUVs. This product comes with multiple power levels custom tuned by a whole team of engineers, and can be installed in minutes without ever popping the hood. The Evolution greatly increases horsepower and torque. Not only does it re-tune your vehicle, it stays mounted in the cab and features real-time, monitoring of vital engine data for a complete gauge package. The Jammer Cold Air Intake design was engineered to move the intake box away from the engine’s heat to reduce warm air flow and catch the cooler outside air. Moving the air filter helps capture the outside cooler air that can be sucked into the engine for combustion. Cooler air brings more oxygen (denser air) into the combustion chamber and that means more power. When combining cooler more dense air to the engine you are able to have a more efficient combustion as well as add more fuel equaling more power.